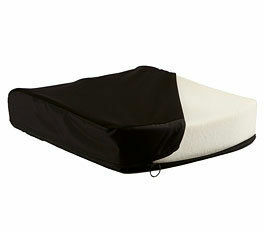 The Terra seat cushion is made of highly resilient foam developed by Ottobock. It dampens impact especially well. With the Terra model, Ottobock offers a cushion that prevents restoring forces and provides pressure relief. It also dampens impact. This is all made possible by the resilient foam developed by Ottobock. Its light weight makes this cushion your ideal companion every day. Given its anatomical shape, the Terra cushion helps patients to maintain their position and also provides support. The Terra cushion will not lose its shape and bottom out – no matter who sits on it.